Robotic prostatectomy has been shown to be a faster operation with a shorter length of hospital stay, lower blood loss, and lower transfusion rates when compared to open surgery. Recent reviews of major studies have shown improved 12-month urinary continence (1), improved 12-month erectile function (2) and equivalent early cancer outcomes (3) with robotic prostatectomy when compared with open and pure laparoscopic surgery. Likewise, the robot has been found to be a superior approach for undertaking complex kidney surgery in terms of kidney function preservation and time spent in hospital (4). The robotic platform affords the surgeon a number of technical advantages. The surgeon operates while seated at a console. He or she is afforded a high-resolution 3-D image of the surgical field with a level of magnification that cannot be achieved through open surgery. 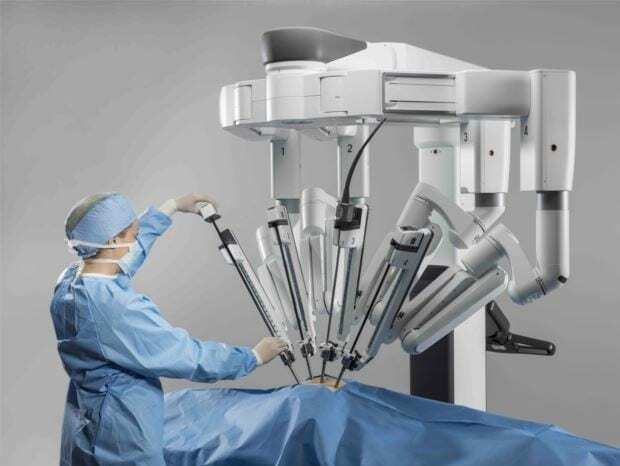 Advanced robotic technology allows the surgeon’s hand movements to be scaled, filtered and translated into precise movements inside the patient’s body. All of these factors allow an experienced surgeon to achieve the outcomes outlined above. The Epworth Hospital network now offers the new DaVinci Xi robot. This versatile platform allows greater reach, flexible patient positioning and improved visualisation compared with the previous generation of surgical robots. (1) Ficarra V, Novara G, Rosen R, et al. Systematic Review and Meta-analysis of Studies Reporting Urinary Continence Recovery After Robot-assisted Radical Prostatectomy. European Urology, Volume 62 Issue 3, September 2012, Pages 405-417. (2) Ficarra V, Novara G, Ahlering T. Systematic Review and Meta-analysis of Studies Reporting Potency Rates After Robot-assisted Radical Prostatectomy. European Urology, Volume 62 Issue 3, September 2012, Pages 418-430. (3) Novara G, Ficarra V, Mocellina S, et al. Systematic Review and Meta-analysis of Studies Reporting Oncologic Outcome After Robot-assisted Radical Prostatectomy. European Urology, Volume 62 Issue 3, September 2012, Pages 382-404. (4) Choi JE1, You JH1, Kim DK2, Rha KH3, Lee SH4. Comparison of perioperative outcomes between robotic and laparoscopic partial nephrectomy: a systematic review and meta-analysis. Eur Urol. 2015 May;67(5):891-901. doi: 10.1016/j.eururo.2014.12.028. Epub 2015 Jan 6.